No he won&apos;t, he&apos;ll be leaving that old twaddle to comedians at the Edinburgh Festival. There&apos;s no journey or message. If you want to go on a journey, buy an airplane ticket. If you want a deep message, run your voicemail through a sub-base woofer. If you want plenty of laughs this is for you. 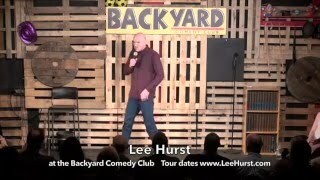 Lee will be turning up, lobbing gags and funny stuff at you from all angles. A hilarious night is about to hit town.